recruitment 2018. Candidates who are qualified 12th class they are eligible to apply online for this Sikkim PSC Recruitment of Revenue Surveyor Posts. 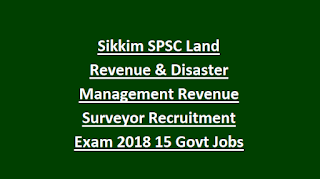 Online applications only accepted for this Sikkim Revenue Surveyor posts through www.spscskm.com. Last date to apply online is 14-06-2018. Candidates selection will be based on written exam on interview. Rejected candidates list will be updates on 19-06-2018. 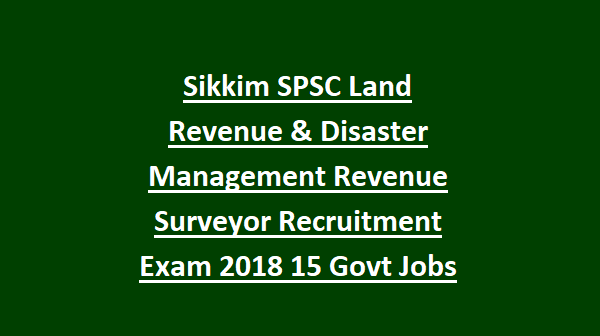 More information about this Sikkim SPSC Revenue Surveyor recruitment no of posts, qualification, selection process, age limits and other details are given below. Exam date or interview dates will be updated later. There are total 15 posts in this SPSC Land Revenue Disaster Management recruitment 2018. As on 30-04-2018 candidates upper age limit is must not be greater than 40 years and less than 18 years. 12th pass candidates are eligible for these SPSC Revenue Surveyor vacancies. Must have computer knowledge certificate and valid local employment card. Knowledge local language is mandatory. Application fee is Rs.150/-. Candidates can pay the fee online only through credit or debit card or online banking. Candidates selection is through written exam and/or interview. Interested candidate can apply online on or before 14-06-2018 through official website of www.spscskm.com. Exam pattern and syllabus, admit card, exam result, rejected application list and other details are available in this website only.